Paperman is the story of a lonely business man waiting for a train. While he’s waiting, a woman also comes to the platform to wait for the train. A gust of wind blows his papers about, one of which lands on her face, leaving a lipstick print. When he turns around, the woman has already boarded her train and is carried away. The man can think of nothing all day except this woman. Must to his surprise, and excitement, the woman appears in the building across the street. He frantically goes through his entire stack of forms trying to get a paper airplane to make it through the window to get her attention. I know in the early days of Pixar, their shorts were a way for them to experiment with new processes or new ideas. 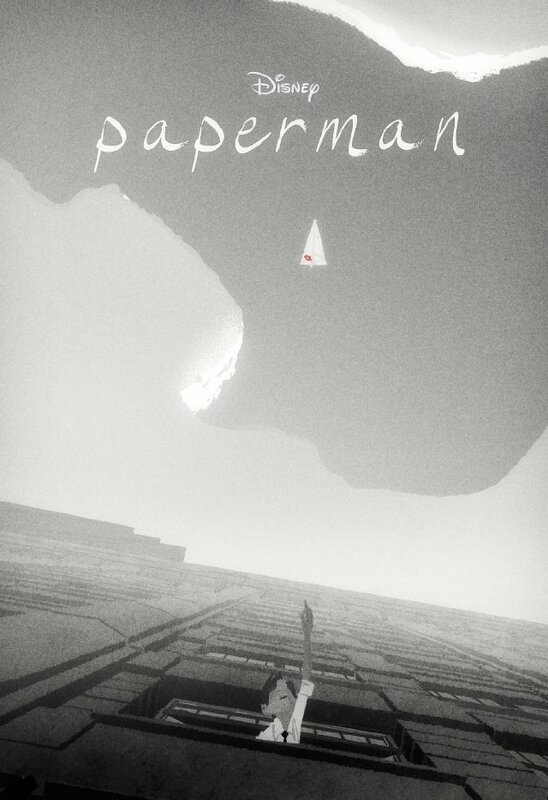 I don’t know for certain if Paperman is of the same ilk. Given, John Kahr’s impressive resume, and his history with Pixar, this would not be surprising at all. I do know, however, that this is a beautiful little film. In a black and white, pencil drawn 3D, the visuals are stunning. There are no spoken words. No soundtrack. Only the sound effects and ambient noise of the scene. It’s enough to keep you paying attention to the story. And it’s a wonderful little story. The kids will find the paper airplane scenes funny, while the adults will fall in love with the entire experience. Wreck-It Ralph (John C. Reilly) is a bad guy. The bad guy of Fix-It Felix Jr., one of the more popular games at Mr. Litwak’s (Ed O’Neill) arcade. After 30 years, Ralph is tire of being the bad guy. Felix (Jack McBrayer) is beloved by the residents of the building Ralph wrecks and Felix fixes. After smashing the 30th anniversary cake and ruining the party, Ralph has had enough. He wants a medal. He’s going to find a way to get one, which means leaving his game. All the games in the arcade are connected by a subway type system through their power cords, leading to Game Central Station. You are free to come and go as you please from any of the games. But, if you die outside of your game, you don’t respawn. And if, for some reason, you don’t return to your game, you run the risk of it being deemed “Out of Order,” which can lead to the game getting unplugged. Ralph finds his way into Hero’s Duty, a first-person shooter where you have to battle a teeming swarm of insects to win your medal. The Hero’s Duty squad is led by Sergeant Calhoun (Jane Lynch). She’s a no-nonsense, tough as nails leader. After the game ends, no thanks to Ralph, he sneaks into the tower to get the medal. Only, on his way out, he awakens one of the bugs, who ends up in the escape pod with Ralph, which crashes into Sugar Rush, a racing game in a land of candy. While in Sugar Rush, Ralph befriends Vanellope (Sarah Silverman), a glitch in the program. Racing is in Vanellope’s code, but King Candy (Alan Tudyk) is against her racing, lest she endanger the game, and her life itself. Ralph is torn with what is the right thing to do. Does he help Vanellope achieve her dream or does he save her life? Can Ralph be true to who he really is? Wreck-It Ralph is one of the few original stories you will see in the theaters. Sure, it’s about redeeming one’s self, and we’ve seen it hundreds of times. But this is done in a truly unique way. And the animation has just the right blend of modern graphics juxtaposed with classic video game graphics. It’s that mix that makes this film so enjoyable. There are plenty of bright, flashy action scenes to draw the kids in. And a generous helping of nostalgia for the adults, as they see their favorite video game characters from their own childhood. The film stops short of making these appearances cheesy or pandering. The cast gels well. Part of this is in no doubt due to the way the movie was recorded. John C. Reilly up to this point has been reluctant to do an animated film. He feared the process sterile, with the actors reading lines alone in a booth. 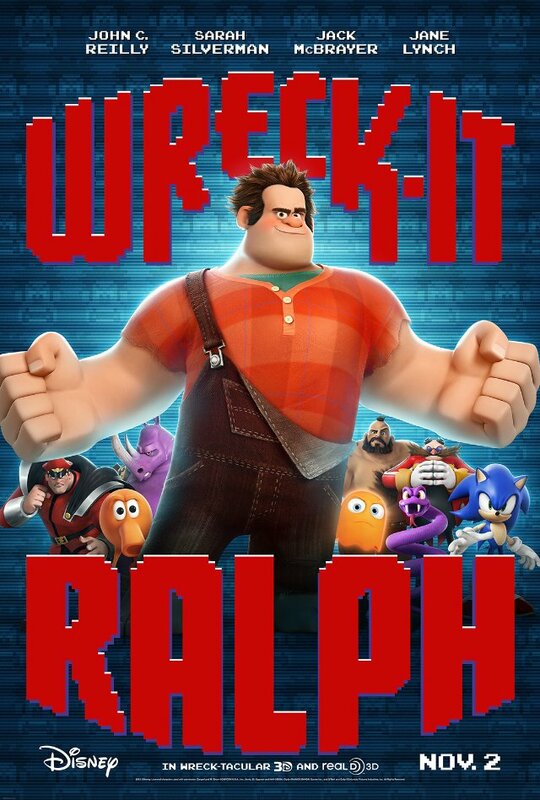 Wreck-It Ralph wrecked that process, having several scenes where the actors recorded together in a group. With a cast like this, that provides ample opportunity for them to riff off each other, giving you a much more polished, and hilarious film. It also helps that much of the cast signed on to the project before the script was even finished. This allowed the writers to tailor each character to the actor playing the role. And it most definitely works.